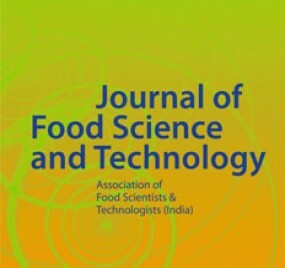 The Journal of Food Science and Technology (JFST) is the official publication of the Association of Food Scientists and Technologists of India (AFSTI). This monthly publishes peer-reviewed research papers and reviews in all branches of science, technology, packaging and engineering of foods and food products. Special emphasis is given to fundamental and applied research findings that have potential for enhancing product quality, extend shelf life of fresh and processed food products and improve process efficiency. Critical reviews on new perspectives in food handling and processing, innovative and emerging technologies and trends and future research in food products and food industry by products are also welcome. The journal also publishes book reviews relevant to all aspects of food science, technology and engineering.